The style of your wedding invitations will give your guests an idea of what your big day will be like – if it is going to be a relaxed and casual event or a sophisticated and formal affair. Just like the design, the wedding invitation printing will also make a considerable impact on the look and feel of your invitations. Offset printing, also known as flat printing, is widely used by businesses and is a commercial form of printing. This method of printing is becoming increasingly common for wedding invitations as it is affordable to print in bulk. Engraved stationery is available from specialty stationers. In the past, this was the only method used for printing wedding invitations. A copper plate is made of the invitation in reverse, and is placed under pressure to receive the ink to give it a raised finish. This also gives the invitation a slight dent on the reverse side of the printed card or paper. This is an expensive option due to the copper plates that are used. These are given to the customer and can be used for example, for the cover of the wedding photo album as a feature. Engraving is often used for personal stationery because the information on the copper plate can be used repeatedly at a fraction of the initial cost. Engraved printing is the most elegant method of printing and is still used today by those with a discerning taste. If you are using this printing method for your invitations, then you should use it for all other components of your wedding stationery in order to keep the look uniform. You could have each invitation hand written by the calligrapher. Bear in mind that that the majority of calligraphers charge by the hour therefore this could be more expensive than printing. The alternative is to have a calligrapher design your invitations and then have their design printed on your stationery. After the printing process, the addition of a guest’s name on the invitations and the addressing of the envelopes can be done individually with the help of a calligrapher. Thermographed wedding stationery is currently the preferred type of printing, producing an elegant look, and is available from specialty stationers and printers. This method is less expensive than engraved printing as it doesn’t use a copper plate but the finished result is similar to engraving. The invitation is printed offset, and while the ink is still wet a powder resin is applied and heated to give the raised finish. Many invitations can be formatted and printed from a computer. This is acceptable for a casual gathering of guests or for party invitations. 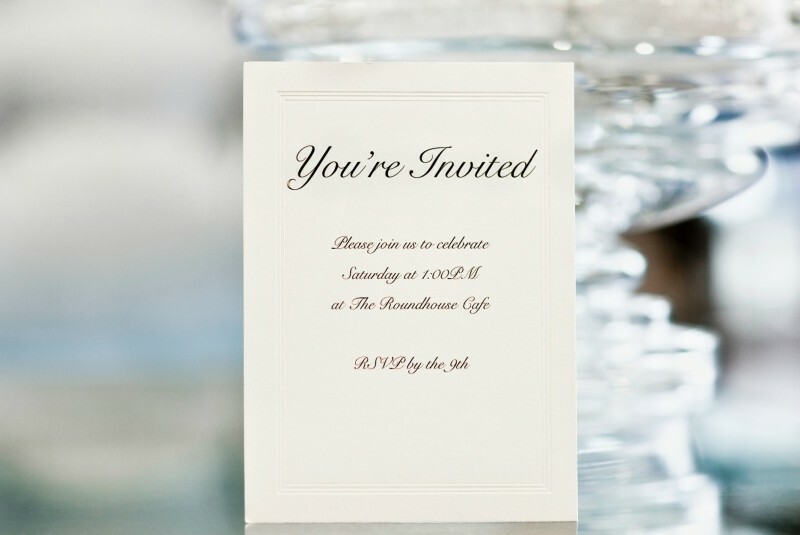 There are also a lot of invitation companies that use this method of printing, as it is low in cost, and quick and easy. It is usually done using a laser printer in black ink. A lot of invitations are printed this way. Hand written invitations are appropriate for a more casual affair or a small intimate group of friends and family. In most cases the wedding would be held at home. 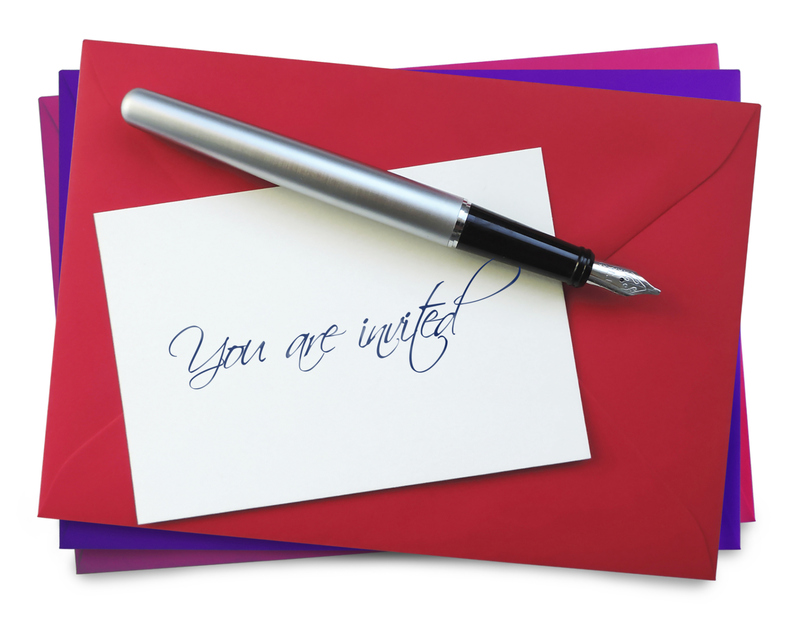 The best results are achieved using ink and not a ballpoint pen in order to make the invitation look elegant. The invitation is usually written on personal stationery and worded in a letter format.